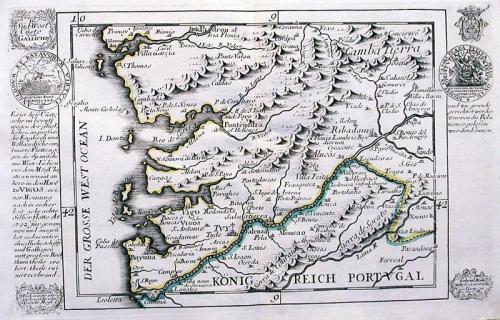 This engraving shows the Spanish coast of Galicia stretching from the Portuguese port of Caminha in the south, to the Spanish town of Padron in the north. Numerous mountain ranges, towns and villages are shown. Text to the left and right of the map relates the sea battle between the combined English and Dutch fleets and the Spanish West Indies fleet. This encounter took place in 1702 outside of the port of Vigo. A miniature circular engraving inserted in the left column depicts the battle. Scarce. Fold(s) as given.